Hardkernel ODROID-XU development board launched for $149, and now costs $169. Hardkernel has recently announced a cost-down version named ODROID-XU Lite, with almost exactly the same specifications: Samsung Exynos 5410 Octa Core big LITTLE Cortex A15/A7 processor, 2GB RAM, eMMC storage, etc.. The only differences are that the Cortex A15 cores are clocked up to 1.4GHz instead of 1.6GHz, and you’ll save $30, as the Lite version costs $139. PMIC – MAX77802 10 high-efficiency Buck regulators and 32 LDOs. This price makes it the cheapest Cortex A15 development platform available today. The 200MHz difference corresponds to a loss of 12.5% in raw CPU performance, but Antutu reports about 8% performance hit compared to the original version of the board. 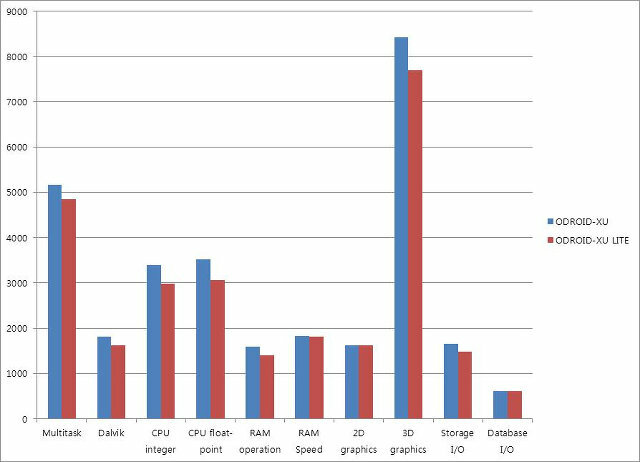 There’s virtually no difference in terms of RAM bandwidth, database I/O, and 2D graphics. The company provides support for Android and Linux for their ODROID-XU (Lite) boards. To get further information and/or pruchase the board, visit Hardkernel’s ODROID-XU Lite product page. Alas it’s the Exynos 5410. The old dual core 5250 and the newest quad the 5420 both have Mali gpus that have ever-improving Linux support, but the 5410 has a powervr chipset that has next to no hope of ever having usable drivers in Linux. One of the oldest graphics chips around- 1998!- and still no interest from Imagination in making the hardware usable. Who told you that there’s no hope to bring PVR to Linux? As a Hardkernel employee I can affirm that we are working onto bring that to Linux too. Not sure where do you took this statement. Are there any different between SOC from this board and soc that samsung get in to phones? How many SPI channels are there? My apologies Mauro, I think. Good luck to your team! I look at the state of open source linux drivers every season. There hasn’t been any good news on PowerVR for the past 15 years: occasionally Phoronix mentions that something might be happening, but nothing ever comes of it. I would be delighted if you guys were able to change that. PowerVR seems to make good hardware, but good hardware without drivers is just really expensive sand. Are you guys attempting to get Linux native drivers going, or is this a libhybis approach? I think he was referring to native linux drivers. libhybris has already been ported on the XU, and apps like XBMC work well with the android PVR drivers. on the 30Pin connector there 1 SPI channel. You can bitbang another SPI or two. Yes. We at hardkernel really believe in OpenSource however when it comes to GPU drivers there’s nothing that we can do about it.